Instead of creating the course again from scratch, it can now simply be copied, and the content can be edited from within the new course. If you would like separate cohorts of students to go through a course together but do not need to change any course content, creating a new class within the same course would be a better alternative to a course copy. Next to Course Name, type the name you would like your new course to have. Once you have done this, the Course URL section will fill itself in. Note: Course URLs cannot be changed once created. If you would like this course to be part of an institution, choose one from the Institution dropdown menu. Note: You must be an admin within the institution in order to do this. Click Create a New Copy and wait. It should take about 15 to 20 seconds for the process to complete. 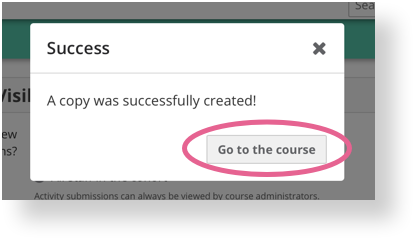 When a copy is successfully created, you will see a success pop-up with a button to go to the new course copy. You can also access the new copy from your course list. If there is an error pop-up instead, please check to make sure you've entered the correct information and have the right permissions. If you've already tried everything and the error still occurs, please email us at support@openlearning.com for assistance. 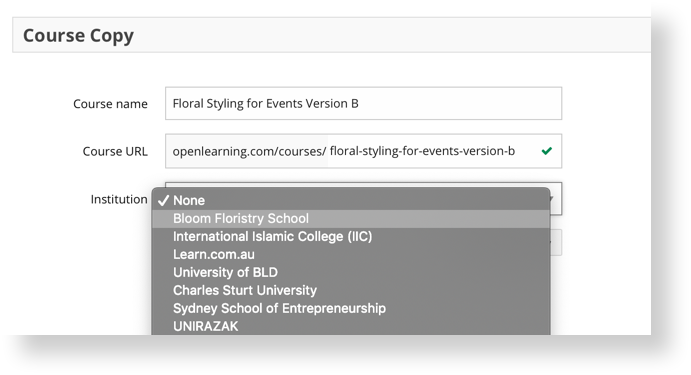 Please note that courses created via course copy will not automatically be listed in the OpenLearning Marketplace. If you would like this course listed in the Marketplace, you will need to submit it for review via Step 3 of the Setup Wizard. What gets copied across to the new course? What doesn't get copied across to the new course?